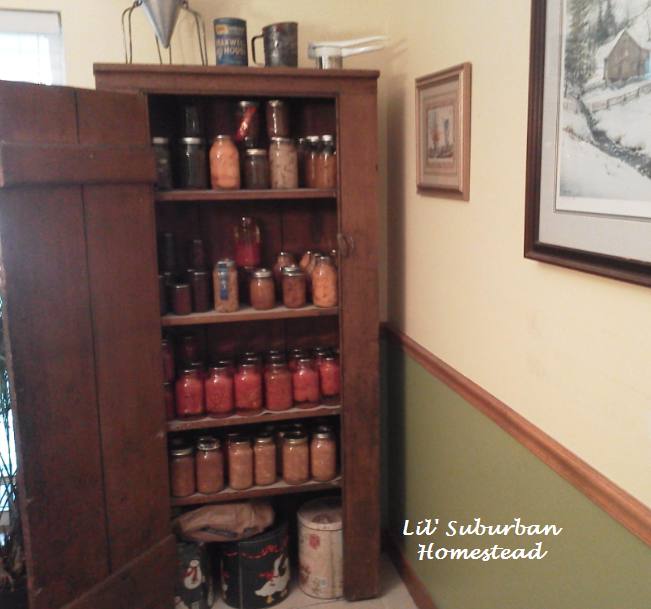 Primitive Canning Pantry Cupboard – Happy Early Christmas To Us! Sometimes you don’t know what you want until you have it and that really was the case with me and this primitive canning cupboard. My husband loves to find deals at antique and vintage shops and me not so much. Oh and he got a major deal on this antique cabinet he only paid $60.00 we couldn’t have made it for that unless we had made it out of pallets like my friends Jim & Mary at Old World Garden Farms. Don’t get me wrong I love a good piece of furniture and a useful tool of the trade but I just always think that we need to De-clutter not add to our clutter and so goes the dance of our 23 year marriage! Give and Take…Take and Give….So the other day he texts me a photograph of this primitive pantry while I’m at work and let me just say it looked awful in the text and I really wasn’t interested and I was swamped at work so I did not respond right away. I come home later that day and he says “I have a surprise for you!” Now one thing I am truly thankful for this month is my husband and all of the surprises he has for better or for worse….so he proceeds to tell me that he has purchased this cabinet. Interestingly I have wanted some place to store all my canned goods but when I went to the vintage shop to pick this up with him at first I was not impressed. As a matter of fact when we loaded it up into the car one of the people who worked at the store ran out and told my husband and me that he had admired this cabinet and was happy it had found a good home. But once we got the cabinet into place at home I really took a shine to it as a matter of fact it fits perfectly on the wall where we placed it and it is extremely functional it seems as if it were indeed designed just for this very use! We can even fit about 20 gallons of rice at the bottom of the cabinet along with a huge bag of sugar. Storage in a 1500 square foot rancher is always welcome and it definitely adds warmth in our dining room which as you know it always warms my heart to continue making our home a haven! I love it! I’m sold! I can’t wait to finish filling it up! Now I am doing my Happy Dance and am so glad for this Early Christmas gift! Wishing all of you a pleasant Monday and stay warm folks! By the way thanks for stopping by my Lil’ Suburban Homestead. I love it! And my, look at all you have put up. Congratulations! And thanks for writing about this, and inspiring me. Love this! Nothing like a pantry full of home canned food! Beautiful in my eyes! The cupboard is GREAT Karen but the real treasure is there in those jars 🙂 Way to go Hubby! 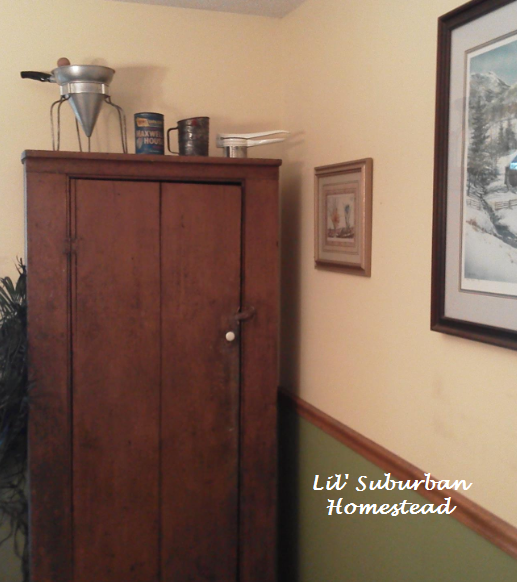 I absolutely love the cupboard! It’s beautiful as well as practical. I’m jealous! 🙂 But very happy for you! 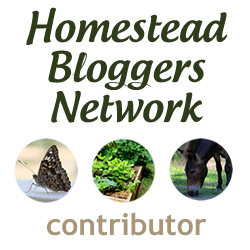 Thank you Rose Petal! I hope you and your family had a wonderful Thanksgiving! I love the cupboard!!! Looks great with all of those jars too! I think it is really pretty! We just got an old armoire at a consignment shop to use as a pantry in our new kitchen. Jenny same concept it sounds like! I was just so excited my husband found such a great deal especially with my reluctance! Have you posted a pic of yours? My family always called these “jelly cupboards”. He made my Mom one from scratch and she loved it too. So you are probably using it for its original purpose, to hold home canned food (including jelly”! Cathy I love this cupboard….I know this one was handmade and its beautiful! I do have jelly in it 🙂 Thanks so much for stopping by and commenting!